Tomorrow my small garden group (only 8 0r 9 of us) meets and we will be talking about what is growing in our gardens. Time to entreat the Spring ephemerals! These are not truly Spring ephemerals as they do not disappear entirely from the garden after Spring. Trout lilies and trillium are more truly ephemerals. My trout lily have appeared but are not yet blooming. But so many of the Spring bulbs and plants such as epimedium and hyacinths have a brief bloom and then are forgotten. I love the purple myrtle. I had an Aunt named Myrtle! Was it a popular name at one time? I’ve never met another – she was quite something! I had hopes of entering the Greenwich Daffodil Society’s show in late April but again I wonder if I will have anything left in bloom. New to me this year, but old to the trade is Daphne, 1914. 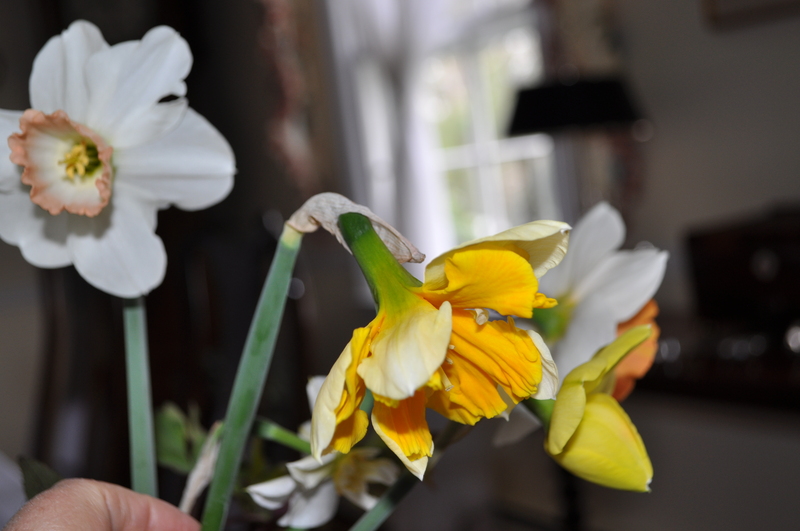 Considered an historical daffodil, I am afraid it will be HISTORY by the time the show rolls around. I have put away some stems in the refrigerator – who knows? I think I will bring a few stems to my friend’s home tomorrow, but it is like taking coals to Newcastle! 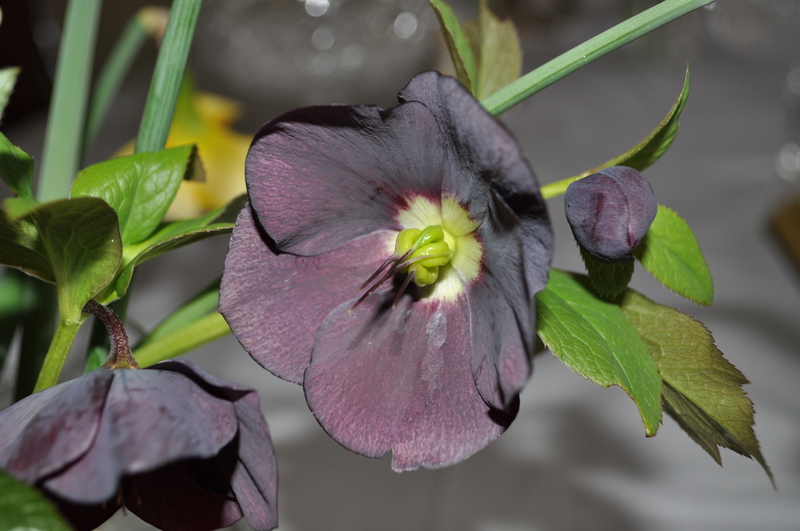 What do you think of hellebores? An acquired taste, I think. I am entreating ephemerals and also entreat you to tell me what is blooming in your garden!! 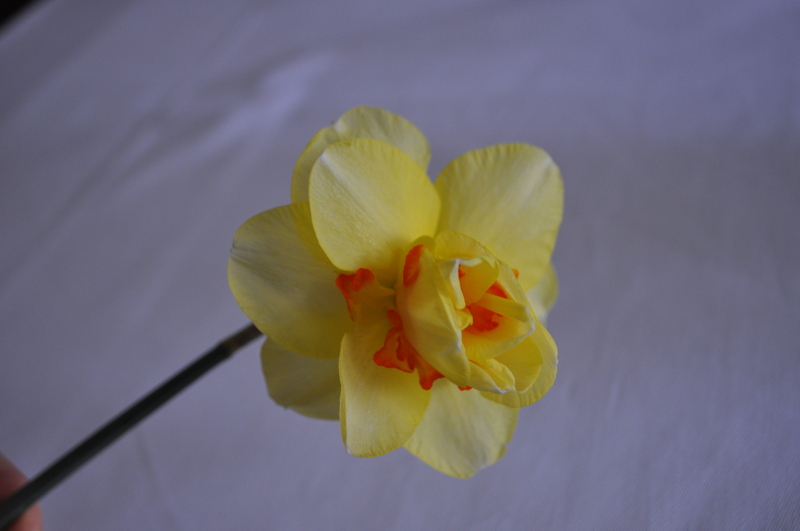 This entry was posted in Uncategorized and tagged Daffodil Daphne, Daffodil Tahiti, epimedium, Greenwich Daffodil Society, myrtle. Bookmark the permalink. How fun to get together with some gardening friends. Love your tulips, and I do love hellebores. Your dark one is beautiful. 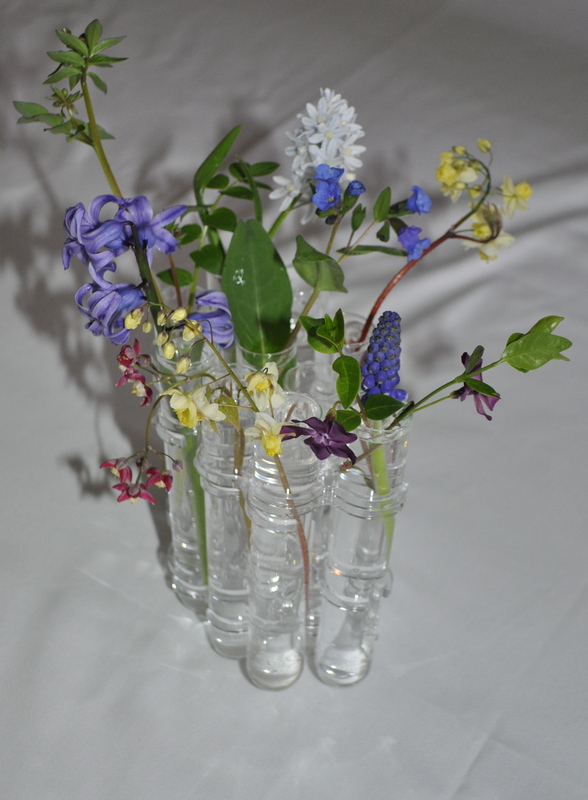 I am especially impressed by your little vases! I have never seen a muscari displayed in a vase! With all the little stems of flowers – that is a gorgeous display. I agree entirely with the first comment. All plants are beautiful when you take a close look at them. Hi There! So nice to meet you! Thank your for your comment on my blog! I adore spring flowers. 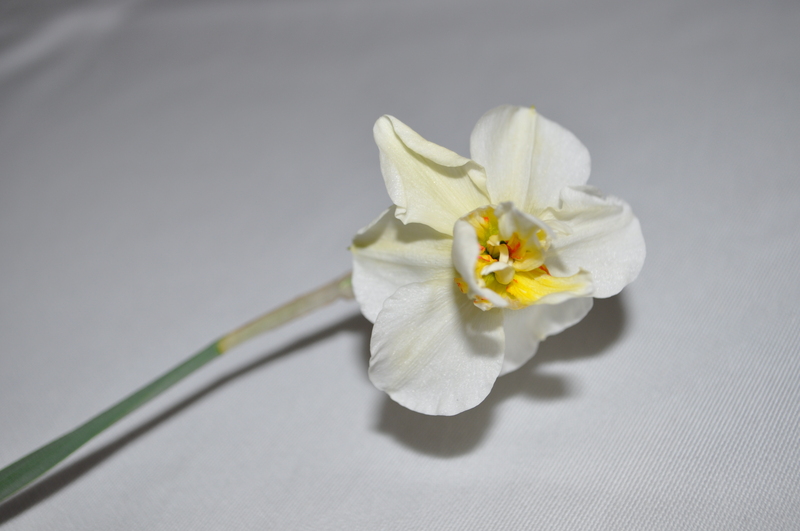 I have had ‘Ice Follies’ Narcissus growing for several years now. When I see the leaves start sprouting up through the cold ground around February, I say to myself, “Hope springs eternal”! Good luck and have fun with your show! I’m happy to be your newest blog follower. So glad to meet you too!